Most conveyor belts in severe duty applications typically don’t just wear out. More often than not, they experience a shortened life from catastrophic events, whether it’s a significant impact, splice failure or piercing damage. Or they suffer from chronic issues such as mistracking or frozen idlers. In addition to correcting such problems to extend belt life, a concern to many bulk material handling operations is the damage from loading, belt wear from cleaning devices and the difficulty of cleaning damaged belts. Since the belt is a major cost element in the process of conveying bulk materials, much attention is focused on reducing wear and damage. In general, loading wear occurs over a long period of time from the discharge of material onto the belt and from contact with conveyor components such as idlers and belt cleaners. Belt wear from loading includes both impact damage and frictional wear. Damage to the belt can be a single event, such as that from tramp metals or oversized lumps in the material flow stream. Such sudden damage can result in catastrophic failure that requires immediate attention, demanding a system shutdown. The negative effects of long-term wear are less dramatic, and replacement can generally be scheduled for planned outages to avoid affecting conveyor availability. One key to understanding belt wear from loading is the chute. The development of Discrete Element Modeling (DEM) as applied to conveyor loading chutes has given the industry a valuable tool for verifying chute designs and predicting conveyor belt wear. A survey of the literature yields evidence indicating belt life improvements of 40-300% from using DEM to optimise chute designs. The primary objectives of chute design are to direct an uninterrupted flow of the bulk solid from the chute to the receiving belt, centred in the direction of belt travel and as close as possible to the speed of the receiving belt. While the interaction between the belt and the bulk material is complex, in general, troubleshooting belt wear caused by chute design can take advantage of some simple relationships. The first is the general relationship between material impact angles and the wear rate of rubber. Figure 2 shows that as the impact angle increases, the wear generally decreases. The second fundamental principal that can be applied to chute design to minimise belt wear is the speed of the bulk material stream, which is affected by friction and acceleration due to gravity as the load falls to the belt. The coefficients of friction between the bulk material, chute and belt are important parameters that are utilised in DEM programmes to optimise the shape of the chute, producing the desired exit velocity and direction of the discharged bulk material. Common chute configurations include rock boxes, inclined flat chutes and curved chutes, as shown in Figure 3. Ve is the exit velocity of the bulk material stream from the chute, and Vb is the belt speed. Other factors to consider when designing the optimum chute for a given application include drop height and preferred liner materials, but in general, belt wear from the choice of chute design is greatest with rock boxes, which do little to slow the material’s velocity and introduce a large amount of disruption as the load cascades from one shelf to the next, then lands on the moving belt at a near-perpendicular angle. Flat inclined chutes help shift the load in the general direction of the receiving belt’s travel, but can involve even greater impacts than a rock box, depending on the drop height. The violent landing takes a constant toll on the belt, often creating significant amounts of fugitive material in the form of dust and spillage. Belt wear from loading impact is generally minimised when using curved chute designs, as the bulk material stream’s velocity can be most closely matched to that of the belt with curved chutes. Figure 4 shows the relative differences in loading velocity vectors. Vey is the bulk material stream velocity perpendicular to the belt and is the primary factor in belt wear. The wear of the belt is proportional to the magnitude of Vey, so minimising this component through chute design is a focus of a DEM analysis. Figure 3 is a generalisation, but it shows that the exit velocity of a curved chute is the lowest of the three design choices. This is due in part to the force resulting from the curved chute, which tends to reduce the impact velocity (Vey) relative to a flat chute, even if the basic discharge angles are similar. 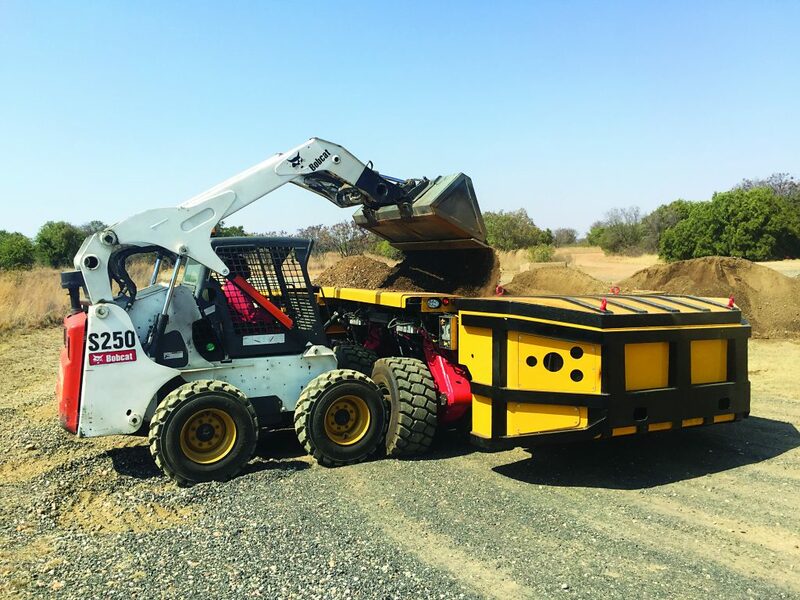 Rock boxes may reduce chute liner wear, but can create significant belt wear due to the relatively high vertical velocity and the resulting shearing action between the bulk material and the belt as the load gets up to belt speed. While belt wear is the main concern, a significant amount of attention should be paid to the selection of liners to prolong chute life. Given the relative cost of the belt compared with the chute in most applications, the wear liners should be considered sacrificial components, and attention would be better spent on improving chute design, selecting lower friction liners and making the liners easier and quicker to change. Some manufacturers have engineered new designs for liners that can be serviced from outside the chute, for example, eliminating the need for confined space entry and drastically reducing replacement time. Cleaning efficiency is related to the material properties, number of belt cleaners, the mechanics of a particular belt cleaner design and the belt surface, among a host of other variables. It’s a common expectation that a conveyor belt can be cleaned with an efficiency approaching 100%, but even a brand new belt has macro and micro defects that make cleaning close to 100% practically impossible. These imperfections can result in as much as 60g/m2 of carryback passing a belt cleaner station with a new belt. When the belt surface is damaged, the amount of carryback that can be shielded from belt cleaning in scratches and gouges can be even more significant, in the order of 100 to 200g/m2. Figure 5 shows how much carryback can be contained in a single scratch measuring 2mm wide by 1mm deep in the belt top cover. The US Mine Safety and Health Administration (MSHA) estimates that 85% of all conveyor problems, including wear, come from fugitive materials. Fugitive materials are those that escape the conveyor other than at the discharge, including spillage, dust and carryback. Since carryback is a significant source of fugitive materials, which in turn are a significant contributor to belt and component wear, it makes sense to focus on adequate belt cleaning. Much attention is paid to the price of belt cleaners and replacement blades. Like chute liners, belt cleaner blades should be considered sacrificial components, and the focus, rather than being on price, should be on installing an adequate number and appropriate type of belt cleaners that can be easily serviced. Cleaning damaged belts is best accomplished using water in combination with mechanical scrapers. In severe cases, brush cleaners are effective in removing material from damages such as skirtboard grooves, but brush cleaners require more frequent adjustment and replacement than mechanical scrapers. With a belt in good condition and given professional maintenance, a belt cleaning station can usually control carryback to within 10-100 g/m2. 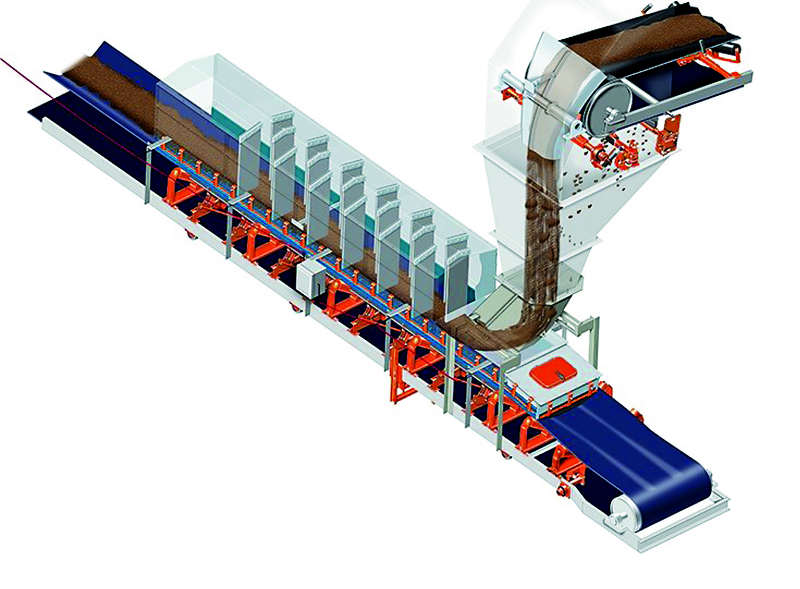 The Conveyor Equipment Manufacturers Association (CEMA), in its seventh edition of Belt Conveyors for Bulk Materials, has established a system for rating the difficulty of the belt cleaning application and for desired levels of carryback exiting a cleaning station to aid users in specifying belt cleaning performance, rather than making decisions based on brand preference or price alone. In today’s demanding applications, it’s common to use three or even more belt cleaners on a conveyor, which produces concern over belt wear. Several research studies have shown that there are critical cleaning pressures and angles for the various types of mechanical belt cleaners using elastomer and hard metal blades. The pressure ranges are in the order of 15 kPa for cleaners with a positive rake angle and 100 kPa for cleaners with a negative rake angle. Outside of these ranges, either above or below the target cleaning pressures, the amount of carryback passing the cleaner, the belt wear and the blade wear all increase. There are several research studies showing the proper adjustment of belt cleaners and documenting the use of water to keep the belt cleaner and free of debris, improves cleaning efficiency by 5-15%. A common belief is that more cleaning pressure is the answer to effective belt cleaning. In reality, increasing the cleaning pressure beyond the target range will result in additional belt wear, and there is an increased power consumption penalty that often goes undocumented. When dealing with rising energy costs and carryback amounts that can easily reach several tons per hour, the selection, installation and maintenance of belt cleaners should be performed by professionals trained in their application and service. New cleaner designs feature constant pressure to maintain cleaning performance through all stages of blade life, particularly on high speed belts and those with multiple splices. Figure 6 illustrates a variety of rake angles for mechanical blade cleaners. Designs using the different rake angles all have positive and negative characteristics, but the basic question of how much belt wear is caused by the cleaner is similar for similar rake angle designs. Field data is scarce, and it’s difficult to separate the dozens of variables that affect belt cleaning from the factors primarily responsible for the wear of cleaner blades and belts. The best evidence of the trade-off between belt cleaning and no belt cleaning would be obtained from long-term belt life records, which are rarely kept. However, one such data review of detailed records over a 40-year period at an Indian power plant showed that engineered belt cleaning compared with the facility’s homemade cleaners was actually related to a doubling of belt life. Most belts fail for reasons other than simple old age and wear, but this study at least suggests that belt cleaning is likely not a significant cause of reduced belt life. To try and answer qualitatively the question of how much belt wear is caused by cleaning, the author has conducted several laboratory studies. The results show that elastomeric blades wear the belt faster than hard metal blades by a factor of roughly 2:1. It’s postulated that this can be attributed to differences in blade contact area and the differences between the coefficients of friction of elastomers and hard metals against the belt. However, belt cleaners with hard metal blades are more likely to cause catastrophic damage if not properly installed and maintained. Using a major belt supplier’s method of estimating top cover wear due to loading and experimental results of top cover wear from belt cleaners, it is estimated that elastomer pre-cleaners represent about 5% of the top cover wear and secondary hard metal tipped cleaners represent about 2.5% of top cover wear. Loading, on the other hand, under optimum conditions is responsible for an estimated 25% of top cover wear. Curved chutes are effective in minimising belt wear from loading. Belt cleaners do wear the belt, but at a much lower rate than loading. Rather than focusing on extending the life of sacrificial wear materials, making service of wear materials easier and faster should be the goal of design and maintenance engineers.